Many of you have listened or read that the American Thoroughbred is a poor breed choice to use in sport breeding. I have some good news for you: you can stop being ashamed of your Thoroughbred horses! This article is meant to help you understand the sprinting lines in the American Thoroughbred, so you will no longer have to worry about them, and maybe use them to your advantage in creating the perfect sport horse, and to inform the American breeder how wrong this blanket assessment of our domestic Thoroughbred is by presenting the real facts. The American breeder has been coached into a belief that their American brand of Thoroughbred is a sprint only strain, and is a lesser type for sport horse breeding then the more stamina bred Thoroughbreds coming from other countries such as France, Australia, Germany and Ireland for examples. And our American breeders themselves, after hearing this repeatedly from sport horse 'experts' are now repeating this assessment as if it is gospel. The fact is that France is the world leader in producing stamina strains of Thoroughbred, England is a close 2nd and here is the shocker: America is 3rd in world production of stamina racers. But it is even more dramatic than that, because the rest of those other supposedly stamina producing countries hardly make a scratch in stayer production and the American Thoroughbred actually supplies more than twice the amount of stayers as all those other countries combined. I know, you don't believe me--afterall you have listened for years to criticisms of the American Thoroughbred from 'experts' at your breed societies. But let me ask you, did you ever do any research on this yourself? I know you didn't, because until I did I believed those experts myself. Is the modern American Thoroughbred too speed oriented? Yes and no. In America (and in many other countries) racehorses have been selectively bred for the fast maturing brilliant types. There is a quicker return for the racehorse breeder, if it shows brilliance early on--at two, then it can be sold for a profit or even be put to stud. However, many of the sprinter-bred horses do not train on well, and they lack the stamina to succeed at the classics. In order to get that early brillance, the breeders must concentrate the speed genetics which can result in too extreme a type. Plenty of American Thoroughbreds are sprinters--that is true, but what is not true is the assumption that is all America produces. The greater truth is that America 'rocks' in all the catagories of Thoroughbred--we lead the way in Classic length winners, and this is going to be a shocker--we produce 25% of the world's stayers. After more research I discovered something else, the bedrock of the modern American Thoroughbred is the superior ancestors it is descended from--and these ancestors, horses like Lexington RH, are the greatest distance racers the world has ever seen. 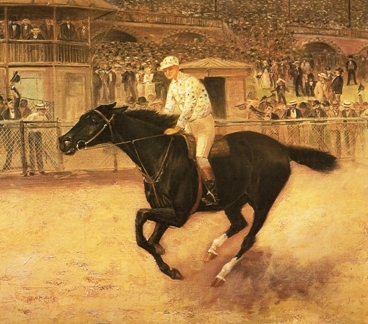 I am not exaggerating, the ancestors of our modern Thoroughbred were regularly running four-mile heat races, several times in one race meet--that means they ran four miles, rested for a short while and then they were off on another four mile race--and possibly another--the winner was the best two out of three heats. If there were three or more racers in the race, and if a different horse won each of the three heats, then they would even have a fourth heat. That means these horses could run eight to sixteen miles at a full gallop in one race. Think about it and read more about the 4-mile racers of yesteryear These racers and their superior sport genetics are sitting in the background of your pedigrees--no other country came close to this level of sport talent. The best news is because of Tesio methods we know how to engineer our lineages so that we build up these amazing individuals in the background. When I first wrote this article I did not have all the information I do now, and was still in part under the 'warmblood spell', so I accepted some of the bias about the American-bred Thoroughbred, and even worried that my own classic length race mare was too close to that dread sprinter type to produce anything good. But now with many years of experience and study under my belt I am much more able to discern the falsity that abounds in our common knowledge in sport horse breeding. Two things to consider, first the American Thoroughbred produces 25% of the world's stayer bloodlines- that is no small amount. Second, those sprint bloodlines are perfectly acceptable breeding material for all sport pursuits- even the breeders of distance racing Thoroughbreds know that they have to add a speed horse now and then to keep the distance speed. It is the individual bloodline we have to look at, is it sound, and is it a pure sprinter or is it a multi-distance length line. Tell me, do your warmblood societies say the mighty line of Nearco or his superlative son Nasrullah are too sprint oriented? Nasrullah is everywhere there are winning sport horses no matter the discipline. Read any article about which bloodlines are showing up in show jumpers, the eventers and sure enough you will find him. Yet Nasrullah, a 1940 Irish-bred, who with plenty of time passed for proper evaluation of his breeding legacy, he is found in the 'Brilliant' column on the chefs-de-race list created by Dr. Roman. Brilliant is one of the sprinter classification columns, and Nasrullah is found only in this one--so this is what his breeding legacy is--Nasrullah is a pure-sprinter sire. Okay, so the Nasrullah factor poses a problem for the 'no sprinter' dogma in warmblood breeding--showing us once again that the facts do not support the bias. However, now we see that like everything else we have learned--it is the bloodline that matters--if the bloodline is a good sport source--like Nasrullah, or even his sire Nearco--who by the way is classified as classic and sprint sire, then it will probably work extremely well in our breeding projects. So what is the real story here? Let's examine the sprinting bloodlines in the modern Thoroughbred and I think you will be a little surprised. The equine scholar Alexander MacKay-Smith traced the speed influences in the Thoroughbred in his Speed and the Thoroughbred . He state that the sprinting lines in the modern Thoroughbred all arise from six sires: St. Simon (English TB), Domino (American TB), Americus (American TB), Haversac (French TB), The Tetrarch (English TB) and Phalaris (English TB). That is two American sources and one French and the other three are English. Hmm. 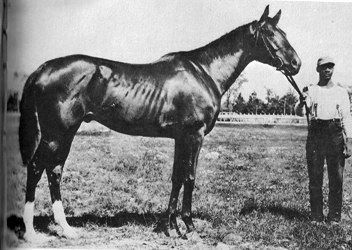 Domino - born 1891 in America, a pre-eminent sprint sire, although his sons Celt and Colin were great classic mid-distance winners and the best of their era. (Colin beat the stayer Fair Play three times including the Belmont Stakes.) Domino is found in our modern sport horse quite often through both Black Toney and Blue Larkspur. Domino is also a powerful in jumpers. See how often Black Toney shows up in the top show jumpers. Domino, who is as close of a guarantee of speed as there ever was, is inbred 3x4x4x4 to Lexington RH and his brother Lecomte RH (sons of Boston RH)--the greatest distance racers of their time, and really any time. They set world records in four-mile heat racing. Domino is a powerful typesetter of speed and overall athleticism and jumpers. Americus is inbred 2x2 to full siblings The Nun/Norfolk, by Lexington RH out of a mare by Glencoe out of an inbred RH mare Chloe Anderson RH--he is an extremely powerful typesetter as well. Domino is everywhere in the American Thoroughbred and Americus is everywhere in the English Thoroughbred, these families are not just good, they are great, the best of their eras, and both of these lines are still today potent providers of the very best in racing and in Olympic style sport. Does your sport horse have Thoroughbred lines in it? Then it most likely carries one or both of these genetic giants in multiples. "Sprinters are built downhill". Another point we often hear is that a sprinter has low withers and a high hindquarter- 'built downhill'. The great equine scholar MacKay-Smith stated that the high hind quarter we so associate with sprinters comes down the genetic trail from the Godolphin Arabian (a Turkoman). Turkoman horses were best at races of four to twenty miles and they were not good sprinters.--So this is not a sprint linked trait. You have a conformation shot of Domino above---it is a pretty level shot, and I found when I set a straight edge on his withers that they were above his hind end--it looks they are an inch or so higher to me--take a look yourself. Is Domino built downhill? Are you ready for some facts about the American Thoroughbred? * The American Thoroughbred is unique in that it arose not just from the English Thoroughbred, but also from our American Running Horse. *The American Running Horse used heat racing as one of its performance tests for two-hundred years 1665-1875 (and sprint racing from 1624-1875) and performed their races at the gallop or pace and later at the trot as well. *The English TB had pacing and trotting racers but culled them out in the 1700s, but early TBs like Bedford, Janus, Miss Hervey, Blaze and Mozart either were pacers or trotters or produced them. *The American Thoroughbred became a breed in 1868 when a branch of the Running Horse had bred in enough English TB to qualify (5 generations of GSB registered stock) and assumed the classic race performance test. *The American Quarter Horse became a seperate breed from its parent Running Horse also in this time (1868) keeping the galloping sprinter lines in power. * The American Thoroughbred and American Hunter have been competing and winning in INTERNATIONAL sport since mid-1800s. Our American Thoroughbred carries bloodlines that are of extreme value for the breeder of sport horses, so potent in speed, stamina and soundness these background lines have made our breed the best in the world twice. 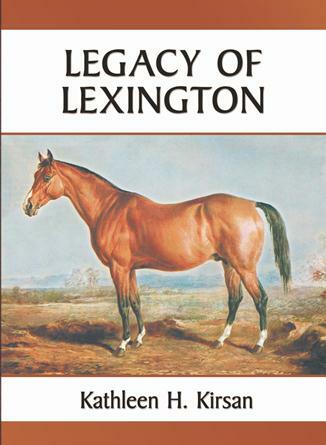 Read the story of our American TB in Legacy of Lexington and how you can recapture the essence of that pinnacle of sport in your herd today. 20 % off when ordered from this site.